Believing in the potent power of the poster. (Still). We may live in the age of the digital, but the poster refuses to go away—whether as a keepsake, and art object, or out in the world fighting for our attention. If the eyes have it, as they say, then the poster always will, too. 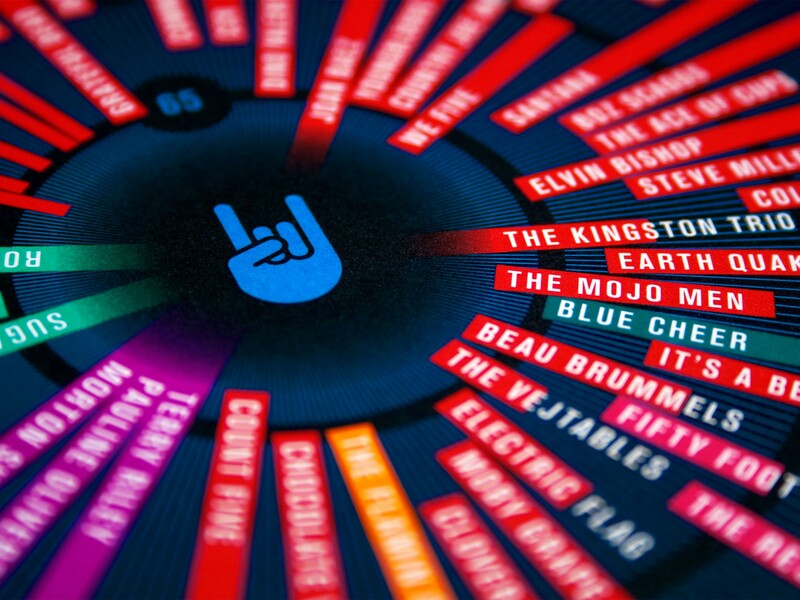 Our contribution to McSweeney’s Quarterly 33 / San Francisco Panorama newspaper, this poster-sized infographic traces in minute detail the history of popular music in the Bay Area. An indispensable resource for any music fan and deft synthesis of large and disparate amounts of data. Volume was one of 25 artists and designers (including Stefan Sagmeister, Maira Kalman, Milton Glaser and Michael Vanderbyl to name a few) asked to create a poster for Public Bikes’ “Public Works” project. The posters were exhibited in both New York and San Francisco (and are still currently for sale). Contributors were asked “to interpret the concept of ‘public’ with a vision to reclaim urban streets, sidewalks and spaces for walking, biking and other social purposes.” Our poster celebrates the friction of urban life and all of its polar, stop-and-go relationships. In May 2008, AIGA asked to Volume to create posters for their “Get Out The Vote” campaign. We were only one of twenty or so designers asked to create a poster that, in addition to being on exhibit at the AIGA National Gallery in fall of 2008, was also displayed prominently at both the Democratic and Republican conventions. We decided to do two—one nuanced and one blunt. Commissioned to promote SFMOMA’s film series, Fidelity and Betrayal: Variations on the Remake, this poster explored the relationships between film remakes and their source material. The poster embodies this concept physically by dissecting and shuffling two images from one of the program pairings, allowing the viewer to “remake” it in their heads. Since the poster folds down to a takeaway promotion as well, it is also perforated along its fold lines allowing the user to physically remake the poster, too. Getting Upper was a poster project and museum exhibition at the Pasadena Museum of California Art that examined how typography, language and communication relate to theories of deconstruction and the visual experience of street art. Our poster exploits the tension between the hand-constructed quality of graffiti typography and the more machined nature of the typefaces designers use every day. Each of the ten letter V’s that make up the final art are “blind contour” hand drawings that use existing fonts as “models.” We then digitized and overlaid the drawings to create interesting figure-ground relationships that play with perception and visual space in the spirit of graffiti lettering. The success of the 2002 Enrichment Scholarship poster (scroll further) put immense pressure on us to avoid a sophomore slump with the 2003 version. After many false starts, we chose to use our internal design process struggles as the central motif, since this would be the one audience that could fully identify with our dilemma. All our writings and sketches for the poster are “poured” into the “process” blender, while our “reward” is the metaphorical butterfly sprung from a companion glass. The poster was left untrimmed, to further reinforce the process. The 2003 Monterey Design Conference conference theme, “Doing Good, Doing Good,” focused on the cyclical relationship between the good of personal growth in one’s design practice, and good of creating a better built world for others. We saw MDC2003 as a potentially vital forum in a post-boom, post-9/11 world, so to kickstart the discussion we asked over 200 people what each “doing good” was for them, and the design sprung from their responses. This poster (which doubled as a mailer) references the two sides of “Doing Good” and how one can’t flourish without the other. It has no true top or bottom and can be hung in either vertical orientation, highlighting “give” or “grow” without denying the ying-yang relationship between them. To further the ”good” of the collateral (and save money), we trimmed the leftover make-ready poster fronts to the program size to create 3 separate full-color covers. What better way to grab the attention of growing design students than through the stomach? Inspired by a nutrition label spied during a lunch break, this ode to design enrichment to promote AIGA San Francisco’s Enrichment Scholarship buries little treasures, both humorous and insightful, for the persistent viewer. Each poster has 12 detachable stubs with the application deadline and contact info, so if hung in a school corridor, the students can take away a reminder to apply.